Angelo has also found a niche within the wig-making industry, which is experiencing a resurgence. According to a recent New York Times article, the current demand for wigs is as high as it was in their early ‘70s heyday. 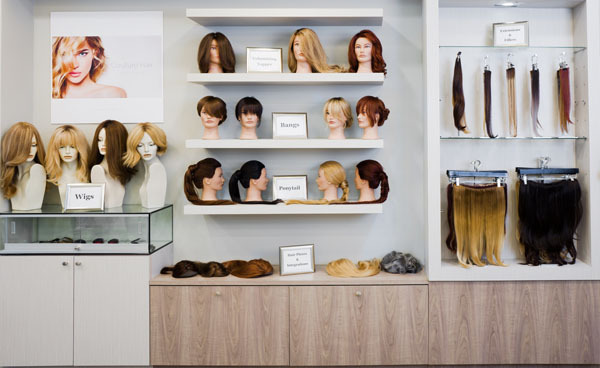 All of Angelo’s wigs, extensions, and additions are made of 100% human hair and are designed on-site to match the client’s unique hair texture, type, and color. He has turned wig-making into an art form, as well as a solution to a variety of hair-loss challenges. He also works closely with cancer survivors and women undergoing chemotherapy, as well as clients who have hair loss from other causes. These causes may include genetics, pregnancy, medical issues, stress, unhealthy lifestyles, and mechanical hair stress caused by styling/pulling the hair too tight. He has a natural talent for connecting with his clients, who may be feel shame or sadness because of their hair loss. That’s the reason why he has such a special name for his consultation rooms. “I call them the dream rooms because they are where women come to talk about their dreams for their hair,” he says. After listening to clients’ particular needs (both men and women flock to the salon), Angelo works with each one to develop the perfect hair solution. To support the maintenance of healthy hair, Angelo has designed a range of products, including HairDetox vitamins and a hairbrush line made specifically for use on hair extensions, hair additions, and hairpieces. He has also created his own line of VOL volumizing shampoo, conditioning spray, and the newest addition, a dry shampoo (Vol Dry).